Are you considering reducing your dairy consumption by switching from cows to goat’s milk? On compassionate grounds, please take a moment to reconsider your choice. The goat’s milk industry results in the death of thousands of kids every year. 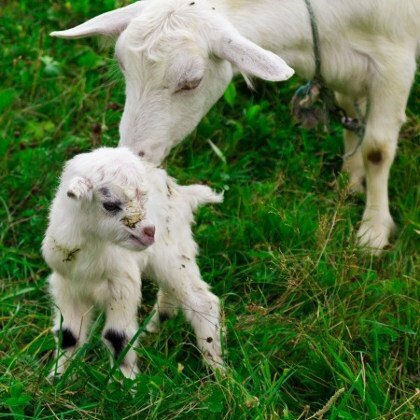 While cows give birth to one calf a year, mother goats typically have twins, or even three kids at a time; thus doubling, and sometimes tripling the pain and suffering caused. Female goats and female humans are similar in the way we breastfeed our young. Milk production is a natural biological function that is triggered in mammals after, and only after, childbirth. Our babies are suckled and nurtured by their mother’s milk. For the first 4 days of the goat kids’ lives, their mother’s milk is chock-full of colostrum. This not only protects them from infection, it also prolongs their life for the insidious reason that the milk is unsaleable at that point. And that is where the fairy tale ends for the goats. When we think of goat’s cheese, we visualise Alpine scenes from ‘Heidi’ with goats grazing in green meadows; their joyful, bleating kids prancing alongside them. There was also a time when we believed in Father Christmas, the Tooth Fairy and the Easter Bunny. However, we all have to grow up at some point, swallow the red pill and face reality. Goat’s milk farms are not farm sanctuaries. When people embark on setting up a goat’s milk farm, it is not some feel-good endeavour to improve the lives of goats. They are setting up a business. To be crass, but honest, they study the optimum way to exploit the reproductive organs of female goats. They then implement those highly invasive, and intimate, animal husbandry best practices in order to achieve the highest yield of milk possible, maximise their profits and turn their farm into a viable enterprise. Unfortunately for the goats, the mothers act as the machines, their kids and their kids’ milk are the products. At the tender age of 8-10 months old the young doe is impregnated. She carries her kid for a 5 month gestation period, and then undergoes natural childbirth. Anyone who has children, knows it is a miracle filled with wonder at bringing a new life into this world. It is also not pretty; filled with bellows and contractions; drama and pain. All mammals experience this. However, mothers who have experienced natural childbirth say the pain is surpassed and erased by the joy of holding their child for the first time. In some mysterious way, Nature has contrived to use pain in order to help us bond better with our children. It stands to reason that because goats are sentient beings, then the experience for goats is no different. Goats are highly social creatures and the bonds they form with their kids are instant and enduring. In another demonstration of science’s inability to see what is in plain sight, there is now scientific proof that a doe will remember and recognise the call of her own kids more than a year after they have been parted. The birthing period for goats in South Africa tends to be August to October. After suckling her kids for the paltry 4 day period, they are taken from her, so that she can be milked for profit for the next 10 months. She is re-impregnated within that time frame in order for her to give birth to 2 or 3 more kids the following season. These kids will again be taken away from her … and so the cycle continues. Until she is no longer a profitable ‘milk producer’. If a mother doe were to be retired at 10 years old, then she could live up to 20, sometimes even 30 years old. However, this is not a farm sanctuary. Any doe that is not producing milk is a ‘subsidised guest’ and as such, not covered in the operating costs budget. This means our grieving mother will be milked twice a day, until the day she is sent to slaughter at the tender age of 6 years old. and classifies her babies as byproducts. So, let’s do the math from the perspective of this doe and calculate the cost of goat’s milk in terms of her kid’s lives. = 10 kids who have been taken from her. Not one person ever wants to admit that the majority of the kids are killed. For a moment, can we please put the fuzzy feelings aside and concentrate on the economics. Imagine if the idyllic scene people carry around in their heads was true: that all the goats lived and none of them are killed, when we eat goat’s cheese. That would mean that Fairview’s breeding herd of 1,000 goats would swell to a minimum of 2,600 in just one year and 4,000 in the second year. This would not only be impossible to sustain, it would make no business sense whatsoever. On average, 20% of the breeding does will no longer be producing enough milk to be profitable and will be sent to the abattoir. They will be replaced with female kids who have been saved from the previous year’s birthing season. In a herd of 1,000 that equates to 200 does killed every year. In a herd of 1,000 you can expect a minimum of 1,600 kids who survive long enough to become marketable products. Save 196 of this year’s female kids and 4 billy goats to replace next year’s breeding herd. That leaves 1,400 superfluous sentient beings that are categorised as unwanted expenses. The kids will be disbudded (de-horned) in the first week of their lives. This is a painful process whereby their budding horns are burnt off. This process can result in brain damage and death. At 4 weeks old the billy goats will be neutered. Between the ages of 12 weeks and 8 months old, every single one of them will be sent to slaughter for meat and leather. Or, worse still, sold for a terrifying ritual sacrifice, where they will endure a slow and painful death. All the while, their mothers grieve for them, hope for their return, and listen for the sound of their voices. Wouldn’t you? There are many tasty alternatives to dairy cheese available in supermarkets across South Africa: Vegusto No-Muh-Chäs is available in 5 flavours from mild to piquant. Cheezly offers various varieties from Edam to Mature Cheddar, ranging from firm to super-melting, with soya and soy-free versions. Sheese creates spreadable vegan cheeses in the tradition of cream cheese, both plain and seasoned with garlic, fresh herbs and/or chives. Why not go vegan? It does provide you with a joyful, healthy way of life; as well as justice for the animals. Discover how easy it is to transition to veganism. It is the best thing you can do for the planet, for your health and for the goats. Get in touch with me if you have any questions and I will do my best to find the answers for you.